Interstate 72 and U.S. 36 at the Mark Twain Bridge to East Hannibal, Illinois. Photo taken by Jeff Royston (02/05/08). Interstate 72 stretches across central Illinois from Hannibal, Missouri to Champaign-Urbana along a mostly rural route. Prior to 1995, the freeway comprised just an 80-mile route east from Springfield to Decatur and Champaign. The Central Illinois Expressway (U.S. 36) extended the route west to Quincy. This included designating a business loop through Jacksonville. 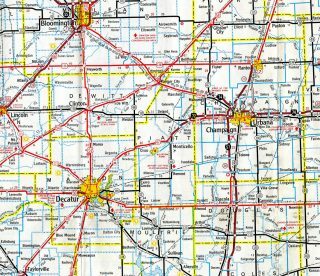 Illinois 110 and Missouri 110, collectively the Chicago-Kansas City (CKC) Expressway, overlap with Interstate 72 east from U.S. 36 and Hannibal to Interstate 172 north. Designated in 2010, the expressway follows a series of preexisting routes from I-35 / 435 outside Kansas City to the Jane Byrne (Circle) Interchange at I-90 & 94 / I-290 in Chicago, Illinois. U.S. 36 is a controlled access expressway west to Cameron. This corridor is also a part of Missouri 110 (CKC). If the Hannibal Expressway gets built around the west side Hannibal, estimated to cost $38 million per a 2007 study, then FHWA may approve extending Interstate 72.6 The bypass would link with the U.S. 36 and U.S. 24 interchange near Rocket Plaza. The proposed extension of Interstate 72 through Missouri from Hannibal to St. Joseph is part of High Priority Corridor 61: Missouri Corridors. Interstate 72 overlaps with U.S. 36 from Hannibal, Missouri east to Decatur, Illinois. U.S. 51 joins the route to bypass Decatur, with I-72 traveling independent of a US highway eastward from Exit 141 to Champaign. 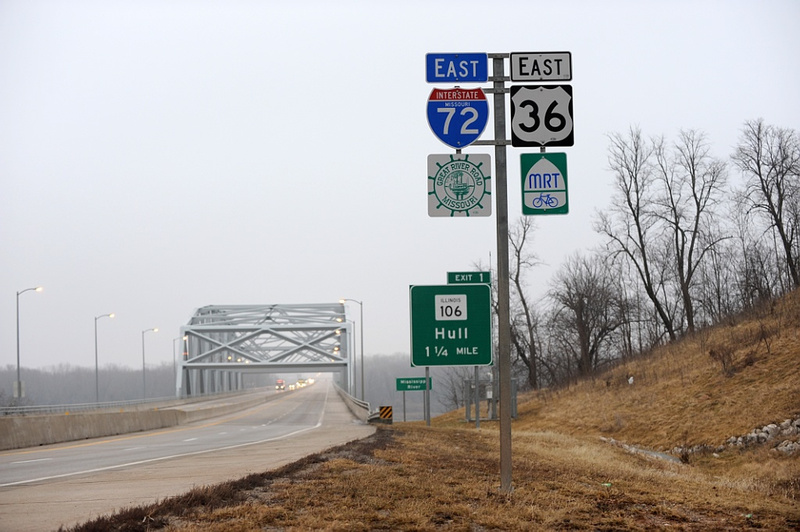 Illinois first proposed the designation of Interstate 172 for the Central Illinois Expressway between Illinois 336 near East Hannibal and I-55 at Springfield. The AASHTO Route Numbering Committee approved the establishment of I-172 on June 9, 1991, with it subject to both Federal Highway Administration (FHWA) approval and completion of the route. The FHWA however preferred to designate this route as an extension of I-72. Due to this change, Interstate 172 was moved to the Illinois 336 freeway spurring north from the proposed I-72 to Quincy and U.S. 24. AASHTO approved both routes on April 22, 1995. Overall length: 4,491 feet; Overall Width: 85 feet and eight inches (including four twelve-foot travel lanes, ten-foot outside shoulders, six-foot inside shoulders, and a concrete traffic barrier in a three-foot wide median). The Missouri approach consists of continuous composite prestressed concrete girders: two are 85 feet long, one is 170 feet long, and the second is 105 feet long. The Illinois side consists of the same type of girders over wetlands: six are 220 feet long, 12 are 130.5 feet long, one is 151 feet long (steel plate girders), one is 218 feet long (steel plate girders), and one is 145 feet long (steel plate girders). The new bridge is located halfway between the existing bridge (old U.S. 36) and the railroad bridge to the north. It is at River Mile 309.6. 11,000 vehicles traverse it daily. The bridge is designed for seismic forces. The main truss span is 89 feet wide and 640 feet long. Hannibal west to Monroe City – August 7, 2009. Monroe City west to Shelbina – June 17, 2010. Missouri 79’s northern terminus is located at Interstate 72 & U.S. 36 in Hannibal. The state highway winds southward to Louisiana, Clarksville and Interstate 70 at Saint Peters. Photo taken by Jeff Royston (02/05/08). Shields posted ahead of the Missouri 79 westbound on-ramp to Interstate 72. Decommissioned by 2015, U.S. 61 Business used to turn west onto the freeway from Mark Twain Avenue for the return to the Avenue of the Saints. Photo taken by Jeff Royston (02/05/08). Button copy signs for the cloverleaf interchange joining Interstates 57 and 74. This exchange lies just two miles north of the I-57 junction with Interstate 72. Photo taken by Michael Summa (1979). The first in a series of guide signs for Interstate 57 appears at the I-72 eastbound crossing of Kaskaskia Ditch. All guide signs for Exits 182A/B were replaced with Clearview font by 2008. Photo taken by Don Hargraves (02/14/03). Interstate 72 ends two miles south of the I-57 cloverleaf interchange with Interstate 74 on the northwest side of Champaign. I-74 runs north across Champaign-Urbana to Danville and Indianapolis, Indiana. Photo taken by Don Hargraves (02/14/03). This sign indicates that Interstate 72 ends within the full cloverleaf interchange at Interstate 57. The freeway however extends another 1.2 miles from Exit 182B to the couplet of University Avenue east and Church Street west to Downtown Champaign. Photo taken by Don Hargraves (02/14/03). County Road 800 East spans I-72 a half mile ahead of Exit 182A for Interstate 57 south. Subdivisions abut the northwest and northeast quadrants of the forthcoming exchange. Photo taken by Don Hargraves (02/14/03). Interstate 57 leads to southern reaches of Illinois by way of Mattoon, Effingham and Mount Vernon to exit the state at Cairo. 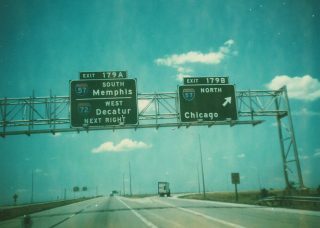 Although the control city designation is Memphis, I-57 does not extend far enough south to reach Memphis. It ends at Interstate 55 near Sikeston, Missouri. Photo taken by Don Hargraves (02/14/03). A loop ramp carries motorists onto Interstate 57 north to adjacent I-74, Rantoul, Kankakee and the south side of Chicago. Photo taken by Don Hargraves (02/14/03). Interstate 72 east crosses a CN Railroad line and Copper Slough ahead of the signalized end at University Avenue east and Country Fair Drive. Photo taken 05/24/08. Entering the full cloverleaf interchange (Exits 235A/B) with Interstate 72, motorists depart from I-57 north for the unsigned spur east to University Avenue. University Avenue crosses the city to the University of Illinois at Champaign-Urbana. Photo taken by Joel Wade (12/12/04). 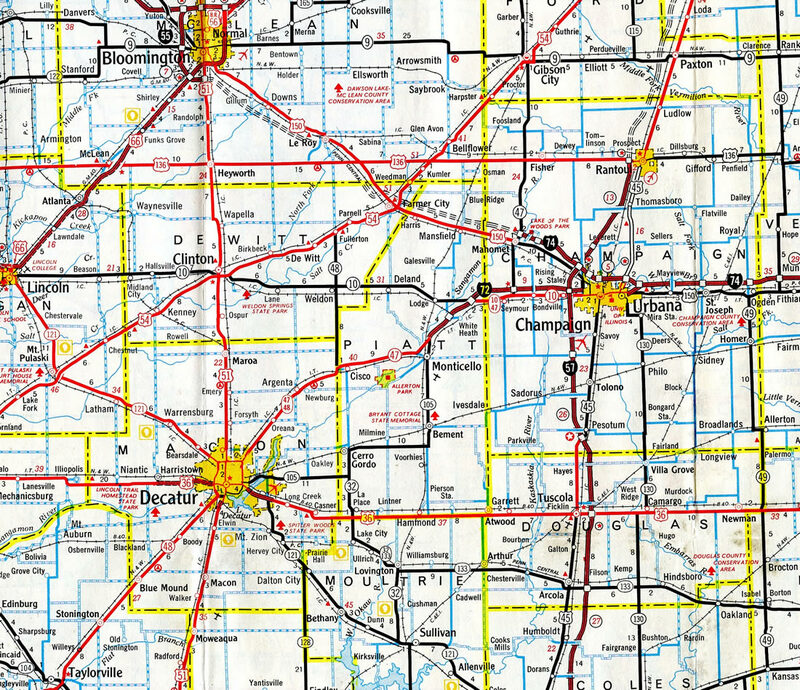 Interstate 72 vacates the suburban west side of Champaign for a rural course to Decatur. Photo taken by Joel Wade (12/12/04). Interstate 57 angles southwest from the full cloverleaf interchange (Exits 237B/A) with I-74 to meet I-72 in two miles. Photo taken by Chris and Amber Lokken (04/06/08). Interstate 72 links I-57 with Decatur and Springfield to the west and University Avenue east to Champaign and the University of Illinois. Photo taken by Chris and Amber Lokken (04/06/08). Subdivisions line both sides of Interstate 57 as the freeway nears the County Road 1700 North overpass and off-ramp (Exit 235B) for Interstate 72 west. Photo taken by Chris and Amber Lokken (04/06/08). I-72 ventures west 40 miles to Decatur and 80 miles to Springfield. Photo taken by Chris and Amber Lokken (04/06/08). Exit 235A follows for the I-72 freeway spur to University Avenue. University Avenue flows east to State Street at West Side Park, two blocks from city hall. Church Street brings westbound traffic from Downtown to Interstate 72. Photo taken 05/24/08. Mathis Avenue separates retail areas to the west from residential areas to the east to the couplet of University Avenue east and Church Street west. An overhead directs motorists to Interstate 72 west at Church Street. Photo taken 05/24/08. Trailblazers for all three Champaign area Interstates stand at the intersection of Church Street west at County Fair Drive. The I-72 freeway commences after the adjacent traffic light. Photo taken 05/24/08. Interstate 72 stems west from University Avenue one mile to the unnumbered ramp for I-57 north to Chicago. Photo taken 05/24/08. The first westbound confirming marker for Interstate 72 precedes the bridge over Copper Slough and the CN Railroad. Photo taken 05/24/08. Westbound Interstate 72 approaches Exit 157 for U.S. 61 (McMasters Avenue). Beyond this interchange, U.S. 36 & Missouri 110 (CKC) continue westward to U.S. 24 near Withers Mill. 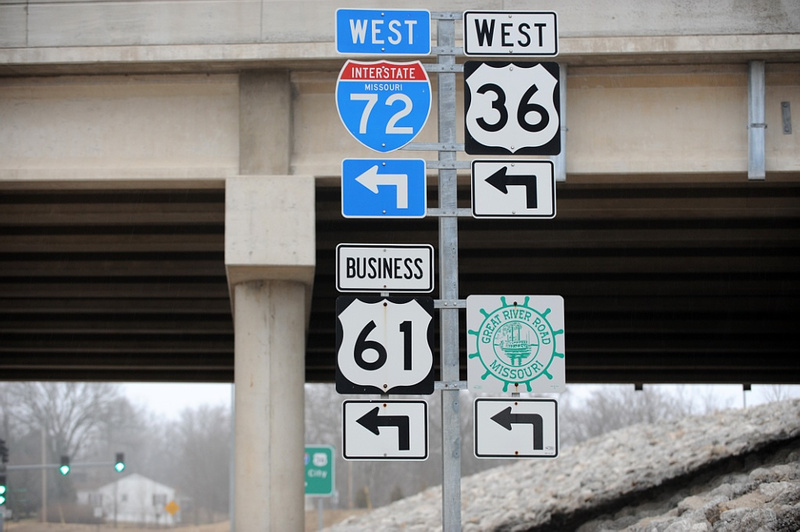 A replacement made for this shield array dropped both U.S. 61 Business and the Great River Road trailblazer in favor of a Missouri 110 marker. U.S. 36 Business and U.S. 61 Business were decommissioned by 2015. Photo taken by Jeff Morrison (04/20/08). 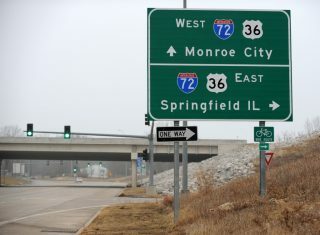 A typical MoDOT end sign for Interstate 72 stands within the single point urban interchange (SPUI) at U.S. 61 (McMasters Avenue). Photo taken by Jeff Royston (02/05/08). U.S. 36 & Missouri 110 (CKC) east reach the SPUI (Exit 157) with U.S. 61 (Avenue of the Saints) and former U.S. 36 Business. New London and Palmyra are county seats along the U.S. 61 corridor. Photo taken by Jeff Morrison (04/20/08). This set of shields was posted along the eastbound on-ramp from U.S. 61 (Avenue of the Saints) to Interstate 72. It was removed after 2010. Photo taken by Jeff Royston (02/05/08). The first confirming marker for I-72 east appears along side U.S. 36 and the Chicago-Kansas City Expressway midway between the Avenue of the Saints and Missouri 79 (Mark Twain Avenue). Missouri 79 was the former east leg of U.S. 36 Business. Photo taken 04/13/13. U.S. 61 (Avenue of the Saints) travels a half mile north from a commercialized intersection with Highway MM and James Road to meet Interstate 72 east, U.S. 36 and Missouri 110 (CKC). Photo taken by Joseph Barnes (08/14/16). The single point urban interchange (SPUI) with I-72, U.S. 36 & Missouri 110 (CKC) lies just north of the traffic light with Ely Road west and Pleasant Street east. Photo taken by Joseph Barnes (08/14/16). U.S. 36 & Missouri 110 (CKC) east become a part of Interstate 72 as the freeway leads away from U.S. 61 (McMasters Avenue) to the Mark Twain Bridge. The subsequent interchange connects with Missouri 79 south to Downtown Hannibal. Photo taken by Jeff Royston (02/05/08). U.S. 61 transitions from a controlled access route to a five-lane commercial boulevard (McMasters Avenue) through the north side of Hannibal. McMasters Avenue continues south from the expressway end 0.7 miles to the interchange with Interstate 72 east, U.S. 36 and Missouri 110 (CKC). Photo taken by Jeff Morrison (04/18/08). U.S. 36 split with Interstate 55 north at the forthcoming cloverleaf interchange (Exits 98A/B) with Interstate 72. Cook Street passes above the freeway in this scene as it extends from Eastdale Avenue. Cook Street west to 9th Street was formerly a part of U.S. 36 before it was relocated onto a freeway bypass south of Springfield. Photo taken by Don Hargraves (02/14/03). Exit 98A departed from I-55 north & U.S. 36 east for the original eastbound beginning of Interstate 72. The subsequent exit joins I-55 with Illinois 54; Illinois 54 is the pre-1972 routing of U.S. 54, from when it extended all the way to Chicago. U.S. 54 ends at its junction with Interstate 72 & U.S. 36 near Pittsfield, Illinois. Photo taken by Don Hargraves (02/14/03). The first set of shields for I-72 & U.S. 36 posted after Interstate 55 and Springfield. The freeway curves northeastward from adjacent County Road 12 in this view. CR 12 is the original U.S. 36 alignment. Photo taken by Don Hargraves (02/14/03). “Interstate designation makes Marion County transportation priority list.” Hannibal Courier-Post, February 20, 2016. “Missouri highways panel hears regional transportation priorities.” Herald-Whig (Quincy, IL), September1, 2016. “REALIZATION OF A DREAM.” State Journal-Register, The (Springfield, IL), November 22, 1991. “ROAD TO THE TOP? DESIGNATION PUTS EXPRESSWAY IN THE ‘BIG LEAGUES’.” State Journal-Register, The (Springfield, IL), April 28, 1995. Route 36 Expansion – Project Information. http://www.modot.org/northeast/projects/route36_projectinformation.htm MoDOT web site. “I-72 expansion near Hannibal on hold for now.” Herald-Whig (Quincy, IL), February 19, 2017. Page updated January 16, 2019.